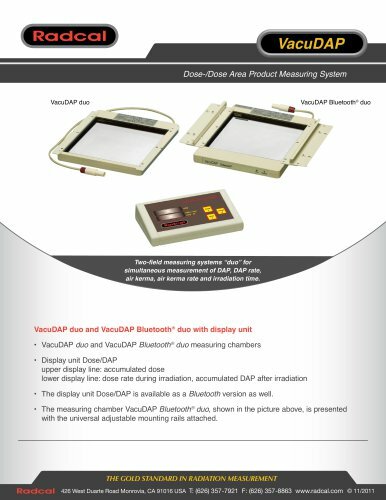 VacuDAP Dose-/Dose Area Product Measuring System VacuDAP duo Two-field measuring systems “duo” for simultaneous measurement of DAP, DAP rate, air kerma, air kerma rate and irradiation time. VacuDAP duo and VacuDAP Bluetooth® duo with display unit • VacuDAP duo and VacuDAP Bluetooth® duo measuring chambers • Display unit Dose/DAP upper display line: accumulated dose lower display line: dose rate during irradiation, accumulated DAP after irradiation • The display unit Dose/DAP is available as a Bluetooth version as well. • The measuring chamber VacuDAP Bluetooth® duo, shown in the picture above, is presented with the universal adjustable mounting rails attached. THE GOLD STANDARD IN RADIATION MEASUREMENT 426 West Duarte Road Monrovia, CA 91016 USA T: (626) 357-7921 F: (626) 357-8863 www.radcal.